such dense forest. I wouldn't know. 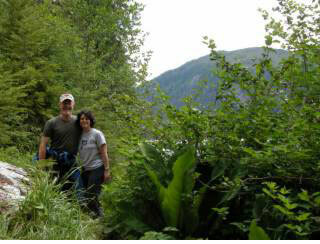 Tim's exaggerating--he and I have both been in denser forests and even denser bush. I bet I know who this is, coward!!! Sorry, Doreen. It wasn't me. However, i have been DEEP in the bush, but certainly not with Tim, and it has been so long that I vaguely remember. I understand that it's a lot like riding a bicycle, though. Are we talking about the same thing? I'm talking about hiking. I don't understand this bicycle stuff. And, manny appoligies! I didn't realize I had two such gifted friends. Now, as for who really wrote this, coward! Show yourself! This page contains a single entry from the blog posted on June 28, 2005 6:22 PM. The previous post in this blog was Worse Than Parallel Parking?. The next post in this blog is A Wild Ride.